Want to limit the amount of times you’re going to need to see us for restorative care due to oral health problems? If so, then reducing your sugar intake is one way to help this happen! However, that doesn’t necessarily mean you want to give up sugar entirely. 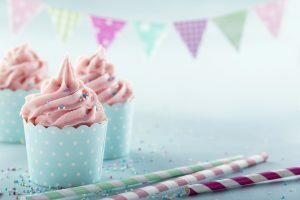 Unless you have an intense sweet tooth, then you may wish to simply consider saving sugary treats for special occasions. For instance, maybe you indulge on your birthday, at weddings, and during winter holidays but the rest of the calendar, you skip candies, pastries, etc. You can still enjoy all of your favorites … just not very frequently! Of course, you know that you can brush and floss after you eat snacks, meals, etc. if you wait about 30 minutes before doing so. We remind you that you may not realize, however, is that the best thing to do after your sweets, whether you’re going to brush or not, is to rinse with water. If you keep it with you all day, every day, then you can always remove a lot of sugar from your smile with this method. It may seem counterintuitive but actually, when you pop a stick of sugarless gum into your mouth after eating anything, it helps to remove particles (like sugar) and it causes you to salivate (which helps rinse teeth clean). Try it! If you’re torn between the chewy gummy bears and the milk chocolate bar, ask yourself which seems more likely to stick to your teeth and which seems more likely to dissolve? In this instance, it’s the chocolate bar! Remember, stickier, tackier, chewier stuff can more easily adhere to teeth, so try to simply rely on oral health logic when you’re doing your best to minimize the length of time your teeth remain coated in decay-causing sugar. When you need tips for things like sugar reduction, remember that there’s no better place to gather advice than from our team! We can help you make realistic changes that will allow you to keep your smile safe. Set up an appointment in Grand Prairie, TX by contacting your dentist at Pecan Tree Dental to schedule a visit at (972) 262-5111.